With Ramadan at day one, I was contemplating what I love about living in a Muslim country during Ramadan. And I came to the conclusion that there are so many things I love that I would like to share with you. First of all, when we moved to Qatar last year it was all so blurry. We were trying to find our feet and make this new country our home. This year we are more settled and I think I feel way more excited about spending Ramadan in Qatar than last year. So here are some of the things I love about Ramadan in a Muslim country especially as a Western Muslim. I love Christmas and the decorations coming up in December but as a Muslim in the West, I felt a little left out during Ramadan and Eid. Well, no worries because in Qatar and other Muslim countries decorations are up and it is wonderful to see them around. 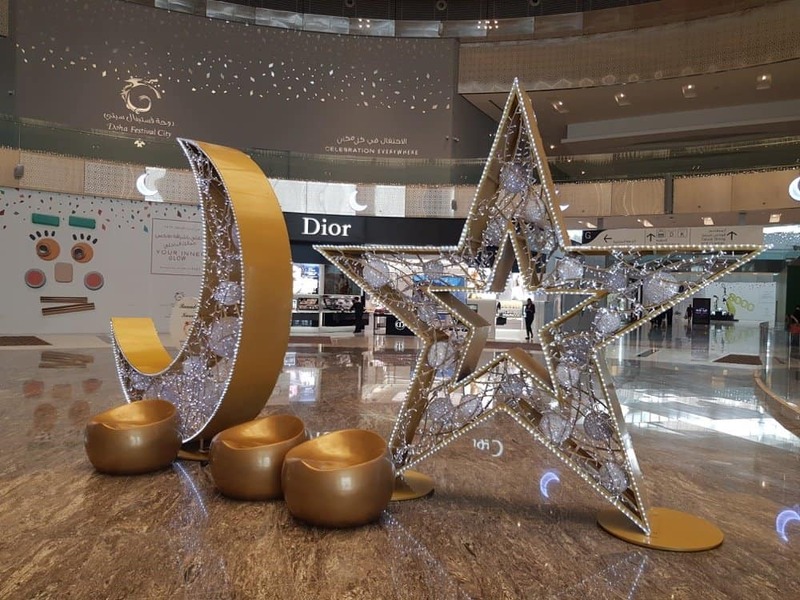 I love the Islamic theme, all the Ramadan Kareem signs and also the creativity involved in making these designs. If you are a Muslim you know that working 8hrs or more a day while fasting can be extremely exhausting. So in many Muslim countries during Ramadan the working hours for all the population are reduced by two hours, so instead of seven hours for public offices and eight hours for private corporations, people will work five and six hours. This is great since with the heat and humidity it can be very tiring. My favourite mosque in Doha is the Education city mosque which has stunning architecture and offers Friday prayers in English. But what I love about living in a Muslim country is the fact that there are mosques everywhere and the community spirit is great. Also, there are women prayer facilities in every mosque so going for Taraweeh (night prayer) is safe and easy even with children. All the restaurants and cafes in the country close down during fasting hours, so food is not permissible to be consumed in public. This basically means no temptations for the fasting population. Personally, I am not offended by people eating while I am fasting but I know many find it hard to resist, so it is good that everyone in the country is fasting and you can’t pass by a restaurant smelling deliciously cooked food while you have an empty stomach. 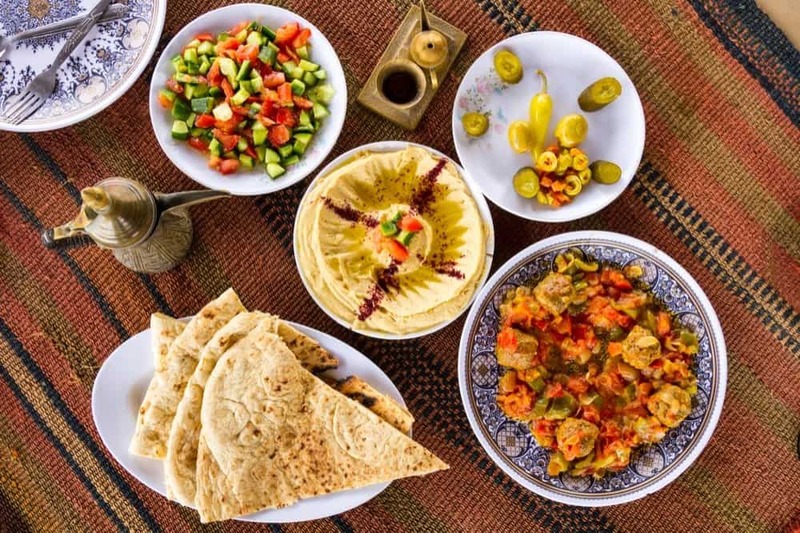 If you had asked me last year what was a Ramadan tent you would have received a totally different answer than today, but in short Ramadan, tents are tents packed with delicious food. After the fast is open people will enjoy dinners out with their family in one of the many Ramadan tents set up around the city in five-star hotels or even in people’s houses. Some of these buffet dinners in the five-star hotels can cost up to £100 per person but offer pretty much anything you can imagine. If done in people’s home it is mostly to brings families together and it is nice to see local people inviting expats for dinner during Ramadan and sharing the culture with them. Just a note not to overeat since it is not uncommon for many people to end up in Emergency services after enjoying all the rice and chicken they can fit in. In the same spirit of the Ramadan Tents, there are many opportunities to provide your time or money for those less fortunate. A big part of Ramadan is also the charity aspect which is a pillar of Islam as well. In the West, we usually set up charity donations to organisations wherein a Muslim country you have the opportunity to actually offer your time and money for this closer to home. It is nice to participate in events distributing food for expat workers or offering food to fasting people to break their fast. I find this to be so much better than just setting up a direct debit to a charity organisation. You are actually able to see your donation making a difference. For people in Muslim countries, their life during Ramadan evolves around their fasting times which means shops are open when people are awake, which means during the night. Yes, you heard that right. During the night shops and malls are open until 1 am. Majority of stores open from 10 am to 3 pm and then from 8 pm to 1 am. This is so that everyone has time to open their fast, pray their prayers and then enjoy some food and shopping. When the temperature outside is 50C it is much easier to run your errands at night. If you are visiting a Muslim country during Ramadan make sure you know when to find stores open. The best part of living in Qatar during Ramadan? We have to fast fewer hours than those in the UK. Fasting hours in Qatar are from approximately 3 am to 6:30 pm whereas in the UK you fast from 2 am to 9.30 pm. Trust me, these fewer hours make it so much easier to actually handle and enjoy the fast. So it’s a total blessing. I am definitely grateful for the opportunity to experience Ramadan in a Muslim country it is certainly different than in the West and it’s a nice opportunity to do so. I always tried to travel during the last few days of Ramadan and get a feel for the spirit of Ramadan in a Muslim country and now I can say I have done this. 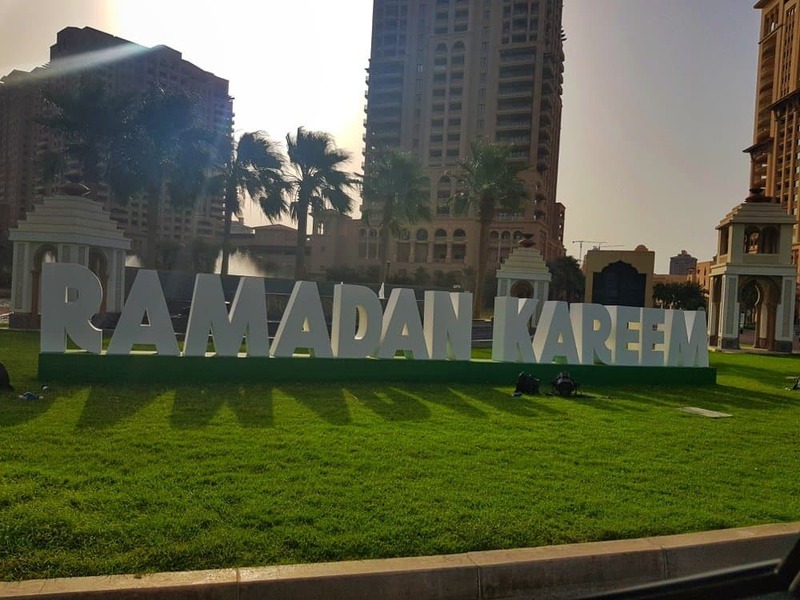 For all fellow Muslims I would like to wish you a Happy Ramadan and for my non-Muslim readers, I hope you enjoyed a glimpse of Ramadan in a Muslim country. Have you visited a Muslim country during Ramadan? What was your experience? Share below. I spent the majority of Ramadan last year in Doha. I attended an iftar at The Westin after finding a good deal on The Entertainer. I also used to pray taraweh at Education City pretty much every night but prayed jummah at Aspire Masjid where the khutbah was in English. On Eid we went to a buffet at The Marriot and saw the fireworks from Katara Village. It was an amazing experience and despite it being around 40 degrees every day I hardly felt it. The shorter fasts also helped! I was supposed to go back this year but had to stay back in the UK unfortunately. However I lol forward to visiting again later in the year insha’Allah and enjoying some delicious karak!